You will have a copy of this novel to read and use in class; as usual, we will use notebooks for class discussions and computers will not be essential. However, if you click the image above, you will find the complete text of the novel online to read at any time. Context is all-important in this unit. It is useful in helping us to understand the world of the books we read, and it is also a common focus in the Paper 2 questions you will face. Here are some research topics to deepen your understanding of ‘Great Expectations’. Charles Dickens, the writer: What kind of man was he? What were his preoccupations as a writer? What issues was he often concerned with in his writing? Nineteenth Century publishing: How were most books published at the time Dickens was writing? How would this affect the style of story-telling? Can you see any evidence of the effect of this method publishing in ‘Great Expectations’? Britain in the mid-nineteenth century: What kind of place was it to live in? What issues did people face in terms of what we would today call human rights? Are any of these issues specifically addressed in ‘Great Expectations’? Karl Marx: Marx and Dickens lived and wrote in London contemporaneously for a while. They both had long beards (though Marx’s was bushier). What other similarities did the two men have in terms of their view of society? 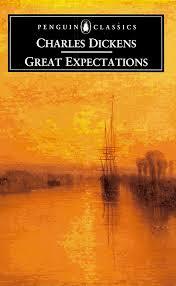 How would a Marxist critic regard ‘Great Expectations’? Here are some questions to answer that will hopefully clarify the main events and developments up to Chapter 22. Dickens is famous for the vivid nature of his characters, their often odd names, and their appearance and ways of speaking. His characters often also represent a certain type of person, and are sometimes very tightly linked to the themes he wants the reader to focus on. Here is a basic introduction to some of the characters in ‘Great Expectations’ which you will build on in your notebooks through class discussions. Dickens had clear themes in mind when he wrote ‘Great Expectations’. We need to discuss these in some depth. Start off with working in groups to discuss the first page of the document below. The document below will also help with themes. Some good news for the English student: Dickens was not subtle when it came to using symbolism in his writing; you can’t miss it! Refer to Page 5 of the document above and do some similar preparation/presentation work on the symbols you find in that page. Provide page references, quotes and explanations. Finally, we will do a bit of work on language and style in Dickens. We will do this by focussing on some short extracts, much as we did when we prepared for the IOP. Here’s the first one, broken down into focussed questions on short sections. It is important to note that Pip is telling his own story. This brings up the possibility of a certain amount of unreliable narration of the kind we have seen before in other works we have studied. What do you think of Pip as narrator? Is he biased in any way? Does he see the whole picture? Is he fair on himself and other people in the story? Have a look at the extract below. In what way does Pip’s speech differ from his normal way of talking/narrating? Here are some more extracts that we may use as further exploration of language and style. You will be expected to write an essay on this unit. This will be a Paper 2 type essay, though it will only focus on Great Expectations (remember, your Paper 2 final essay will be about two of the works you have studied). Here is a choice of essay topics.